The 12th GPS Block IIF navigation satellite received a smooth ride to orbit on Friday, lifting off from Cape Canaveral atop a United Launch Alliance Atlas V rocket. After its 13:38 UTC liftoff from Space Launch Complex 41, Atlas V relied on its Russian-built RD-180 engine to send the trusted Centaur upper stage on its way – first boosting the vehicle into an elliptical transfer orbit to set up for a long coast phase ahead of the critical circularization maneuver over three hours into the flight. 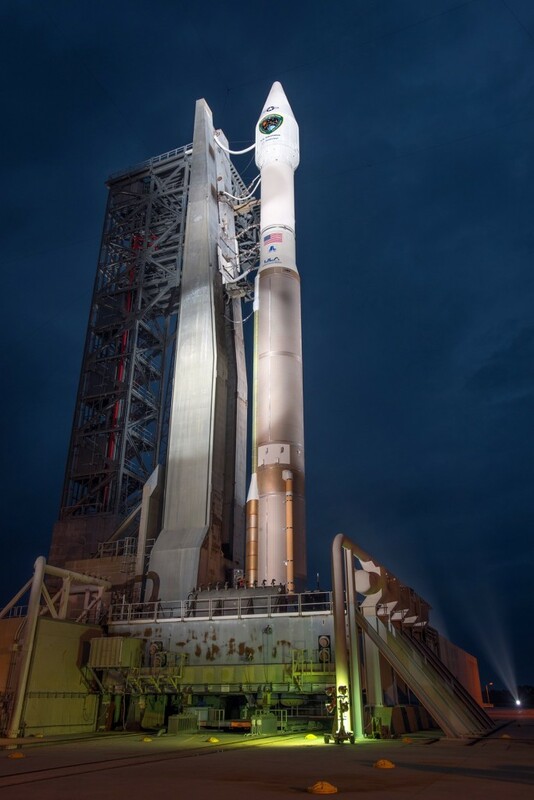 GPS IIF-12 was deployed three hours and 23 minutes after launch, marking the next success for the Atlas V workhorse. Friday’s launch marked ULA’s year-opener, to be followed by up to 14 launches in 2016 using the Atlas V and Delta IV rocket families for missions conducted from both coasts of the United States. 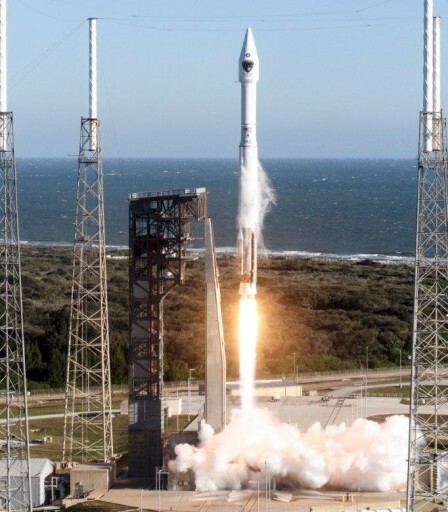 Customers booked for a ride on ULA vehicles this year include NASA, the U.S. military, the National Reconnaissance Office and commercial satellite operators. ULA’s 2016 manifest shows 11 Atlas V missions and four Delta IV flights, including a Delta IV Heavy launch. Now with 104 missions under its belt, ULA has perfected processing operations to enable a fast rate of launches and rapid turnaround times of facilities, as shown last year when the company managed to conduct three successful Atlas V missions in a single calendar month. ULA’s next launch is planned for next Wednesday when a Delta IV rocket will blast off from Vandenberg to deliver the classified NROL-45 payload to orbit for the National Reconnaissance Office. One of ULA’s core customers is the United States Air Force, placing he entire GPS Block IIF fleet of 12 Boeing-built satellites on ULA launch vehicles. The first GPS IIF satellite was launched in 2010 and the deployment of this latest generation of GPS satellites peaked in 2014. There were eight GPS launches in the last two years in one of most aggressive launch campaigns ever, highlighted by a streamlined satellite production process established by Boeing and a rapid launch rate supported by ULA’s Delta IV and Atlas V.
GPS was inaugurated in 1978 and, to date, has seen 72 satellite reaching Medium Earth Orbit, including GPS IIF-12. The Block IIF satellites, each weighing in at 1,630 Kilograms and costing $245 million, feature upgraded clocks with higher accuracy, new signals for increased navigation precision and coverage, and better security as well as a longer in-orbit lifetime. 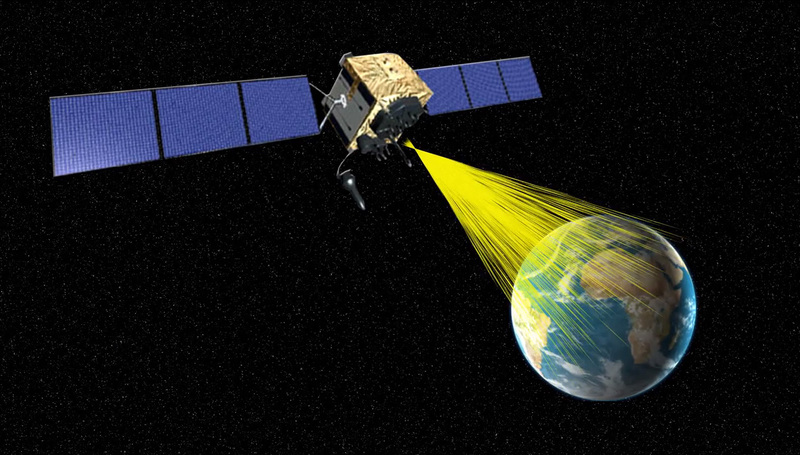 The heart of each GPS satellite is a redundant set of atomic clocks that deliver extremely precise timing signals which are then sent to Earth where they are received by terminals using four signal inputs to calculate the user’s position through the difference of signal travel time from the satellites in their different orbital positions. The GPS constellation requires at least 24 operational satellites to ensure global coverage, 24 hours a day. GPS is used all over the world in navigation systems including cellphone-based systems. Furthermore, GPS comes into play whenever precise timing information is needed, but the constellation has also found applications off the planet. GPS is used for the onboard determination of satellite orbits, spacecraft use it for navigation during rendezvous and GPS signals are used to study the structure of Earth’s atmosphere. The newer generations of GPS satellites also fulfill search and rescue functions. The Block II phase of the GPS constellation was started in 1989 and has seen a total of 58 satellites delivered to orbit, to be succeeded by the GPS IIIA satellites that are being produced by Lockheed Martin and will begin deployment in 2017. Built by Lockheed Martin, the upcoming generation of GPS satellites will add even more navigation signals, both for use by the civilian sector and the military including additional Safety of Life signals. 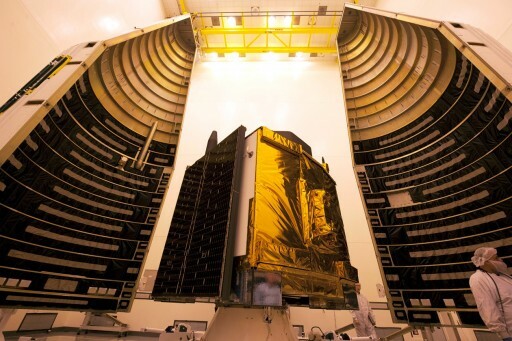 Aside from a better accuracy, the Block III satellites are also expected to remain in service longer than the current satellites which are known to surpass their expected lifetimes on a regular basis. 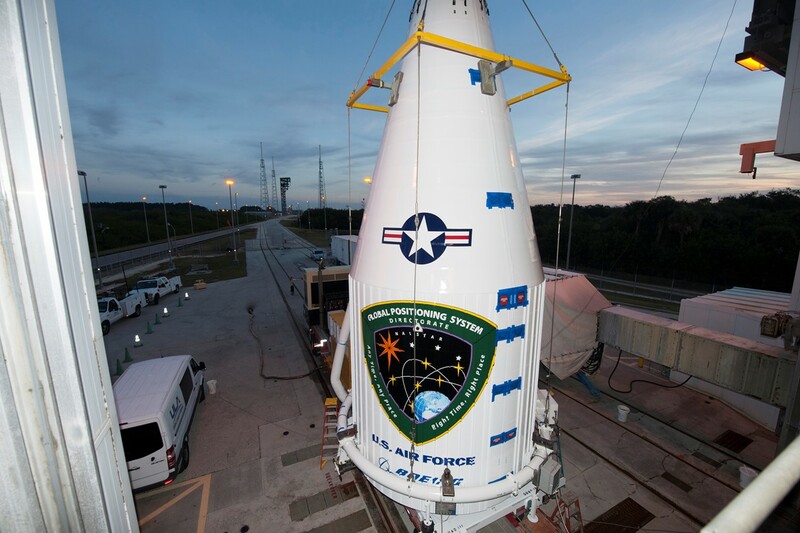 Atlas V, with GPS IIF-12 hidden under its aluminum fairing, was moved to the launch pad on Thursday to enter final preparations for the initiation of the launch countdown at 1:18 a.m. local time on Friday. 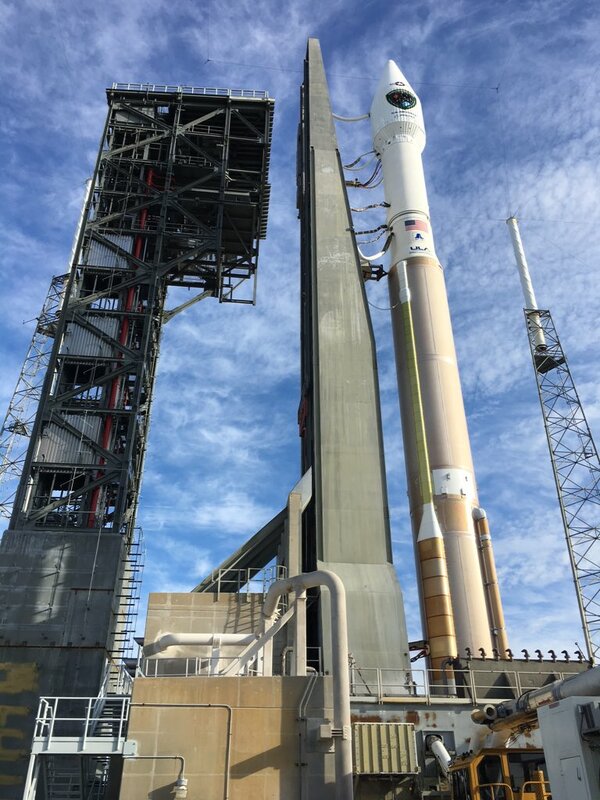 Reporting to console for the seven-hour countdown procedure, the Launch Team powered up the Atlas V rocket and began an extensive set of checkouts while teams at the pad were still busy buttoning up the rocket and all ground facilities to set up for tanking operations. Coming out of a built-in hold at T-2 hours, Atlas V headed into its propellant loading operation. Already loaded prior to the countdown was the Rocket Propellant 1 tank of the Common Core Booster that received 94,600 Kilograms of refined Kerosene, leaving only the cryogenic tanks to be loaded. Over the course of a two-hour activity, the Centaur upper stage was filled with 15,700 liters of Liquid Oxygen and 48,100 liters of Liquid Hydrogen while the first stage was loaded with 185,500 liters of supercold oxidizer. When tanking was complete, the launch team pressed into the final preparatory steps to ready the Atlas V for liftoff, loading a refined version of the flight software version into the Atlas V flight computers. Clocks held at T-4 minutes for a half-hour pause during which the GPS IIF-12 satellite was transitioned to internal power and the launch team conducted its Go/NoGo Poll, providing a unanimous GO for launch after ground winds had calmed down just in time for the opening of the day’s launch window. Atlas V entered its automated countdown to go through the final steps to transition the rocket to a launch configuration, notably the pressurization of tanks, the transfer of internal power and the handoff to Atlas V’s computers leading up to the ignition of the RD-180 main engine. Atlas V started rising from its launch pad at 13:38 UTC and balanced in a vertical posture for the first 18 seconds of its flight. The 58-meter tall rocket then pitched over and rolled onto a precisely planned ascent trajectory taking it to the north-east along a 45-degree launch azimuth. Burning 1,150 Kilograms of propellants each second of powered flight, the two-chamber RD-180 engine delivered a launch thrust of 390 metric-ton-force, pushing the rocket through the sound barrier 78 seconds after liftoff followed 12 seconds later by Maximum Dynamic Pressure. 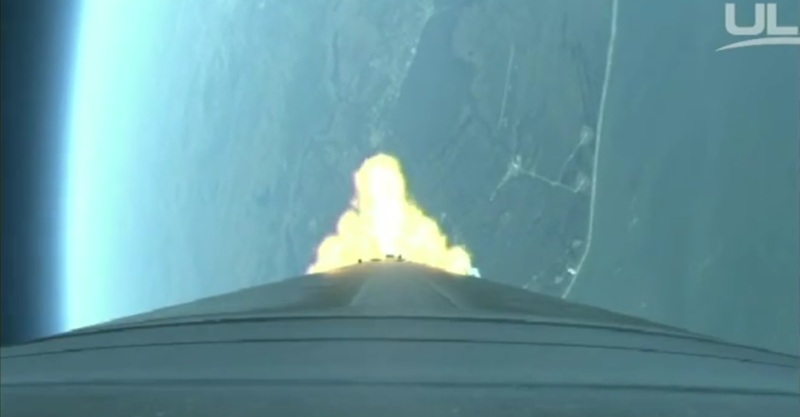 Towards the end of the first stage burn, the RD-180 engine throttled down to limit acceleration on the launch vehicle leading up to the shutdown of the RD-180 four minutes and ten seconds into the flight. Handing off to the trusted Centaur upper stage, the first stage made a clean separation and cleared the RL-10 engine for ignition at T+4:20 to achieve its full vacuum thrust of 11,200 Kilogram-force. 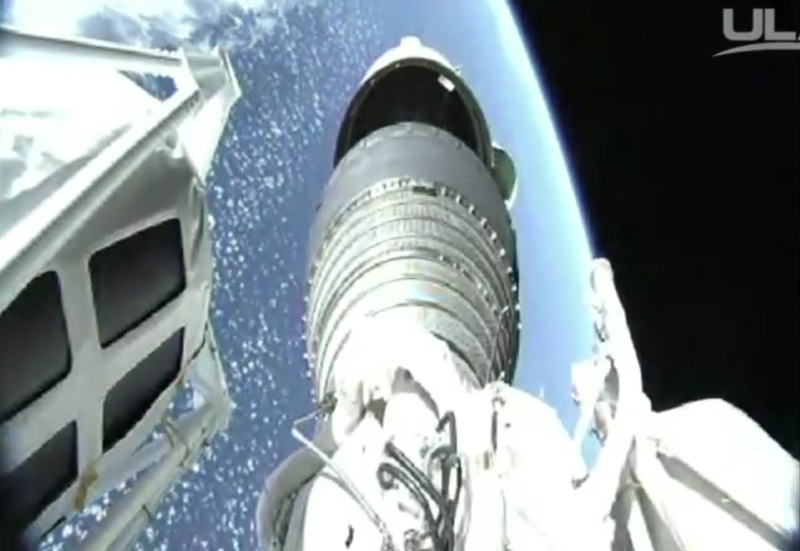 Centaur was tasked with a rather long burn of over 12 and a half minutes to boost the stack into an elliptical parking orbit with a high-point over 20,000 Kilometers in altitude. Real-time calls made during the Centaur burn indicated a very good performance by the upper stage as it headed over the north Atlantic, also shedding the payload fairing once out of the discernible atmosphere. Data displays showed the Centaur achieving a transfer orbit of 167 by 20,250 Kilometers at an inclination of 55 degrees after a very precise first burn. In this highly elliptical orbit, Centaur was set for a long coast phase of exactly three hours in order to climb all the way to the apogee of the orbit so that the second burn could act as circularization. The coast took the vehicle across the Atlantic, over the UK, a large portion of Central and Eastern Europe, the Black Sea, the Arabian Peninsula and out over the Indian Ocean to head to a position to the south of Australia for the second burn. The RL-10C engine re-started three hours and 17 minutes into the flight for a short burn with a planned duration of one minute and 27 seconds, lifting the perigee altitude to match the apogee and deliver the satellite to a circular orbit. GPS IIF-12 aimed for the usual GPS insertion orbit of 20,459 Kilometers, inclined 55 degrees from where the spacecraft can phase into the existing GPS constellation. Separation of the satellite occurred three hours and 23 minutes after launch when GPS IIF-12 was sent on its decade-long mission as part of one of the world’s most famed satellite systems. 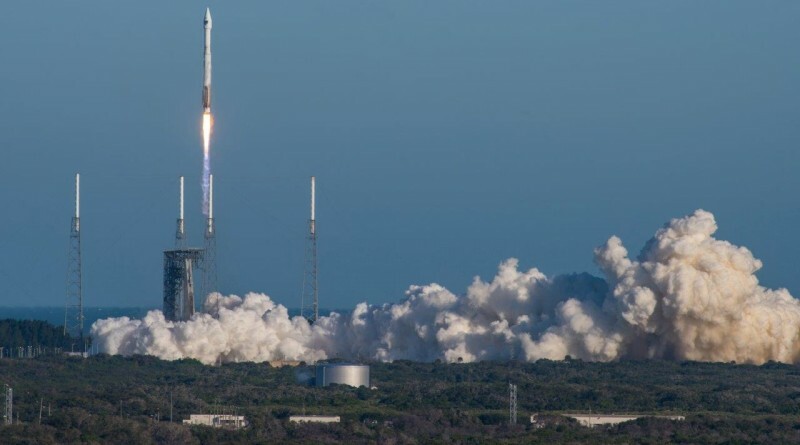 Friday’s launch marked the 61st flight of the Atlas V rocket since its inauguration in 2002, the 31st employing the 401 configuration of Atlas V. It was the 643rd launch of a vehicle named Atlas, dating back to the very early beginnings of space flight in 1957. The IIF12 satellite aims for Plane F of the GPS constellation where it will enter Slot 1 to replace the IIR-6 satellite that was launched back in late 2000 and looks forward to taking a different spot in the constellation from where it will enhance legacy coverage and serve a redundant function. Coinciding with the deployment of the satellite, the GPS program is retiring its oldest satellite, GPS IIA-10 launched in 1990. Plane F was chosen for the last GPS IIF satellite to optimize the coverage of modernized GPS signals that offer a greater accuracy to users. With all GPS IIF satellites taking their spot in orbit, the program can look forward to some downtime in terms of satellite deployments. GPS IIIA, the next generation of GPS spacecraft, built by Lockheed Martin, is currently expected to begin deployment in 2017. The IIIA satellites will continue the incremental improvement of the GPS constellation as aging satellites are replaced with newer, more capable craft. 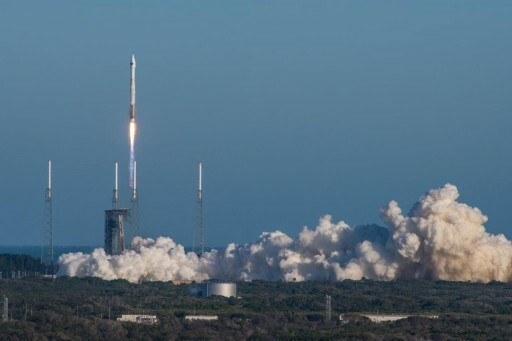 Copyright © 2019 Atlas V | GPS IIF-12 | Spaceflight101. All rights reserved.